Record drawing of a symmetrical panel decorated in the grotesque style with foliage, rosettes and faces, with winged seahorses supporting a central vase, above which is a putto. You are here: CollectionsOnline / Record drawing of a symmetrical panel decorated in the grotesque style with foliage, rosettes and faces, with winged seahorses supporting a central vase, above which is a putto. This drawing and its companion in Adam vol.26/123 are inspired by the antique rather than being a direct copy. The composition can be compared stylistically with other drawings attributed to Giuseppe Manocchi (c.1731-82) in this volume (see Adam vol.26/98, 99 and 105). They may also be related to the decorative panels of James Adam's scheme of 1762/3 for the Parliament House, London found in Adam volume 7. 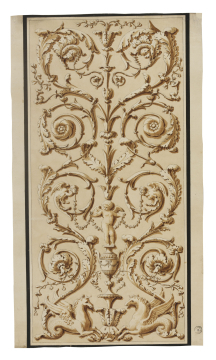 Both compositions are counterparts of those made by Agostino Brunias (1730-96) for Robert Adam in the late 1750s, and also seen in the arabesque plaster panels of the following decade.